Talking with Chris Hardwick Returns with Eight New Episodes! AMC’s Talking with Chris Hardwick returns with eight new episodes featuring a lineup of guests that includes (not necessarily in air order): Chris Pratt, Karen Gillan, Bill Hader, Donald Glover, Ethan Hawke, Seth Rogen & Evan Goldberg. Talking with Chris Hardwick premieres on June 17th (11pm/10C). Blu-Ray Review: Jumanji, Jumanji – Jumanji: Welcome to the Jungle and Jumanji 2-Pack! Jumanji: Welcome to the Jungle may be one of the most authentic video gaming movie I’ve ever seen. Match that with a weird Breakfast Club/Indiana Jones vibe and the result is two hours of pure, high energy fun. The Blu-ray release adds the original Jumanji (and its boatload of features) to th mix. 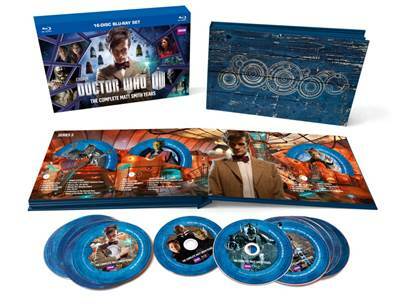 Doctor Who: The Complete Matt Smith Limited Blu-Ray Gift Set (Need We Say More)! Matt Smith’s charming, silly, dangerous Eleventh Doctor has regenerated, but his memory lives on in the new Doctor Who: The Complete Matt Smith Limited Edition Blu-Ray Gift Set. The set includes every adventure of the Eleventh Doctor – including his two-episode crossover with The Sarah Jane Adventures. Also collected here for the first time: The Five Doctors Reboot, Doctor Who at The Proms 2013 and more. Follow the jump for complete details. Doctor Who: The Complete Matt Smith Limited Edition Blu-Ray Gift Set will be in stores on November 4th.